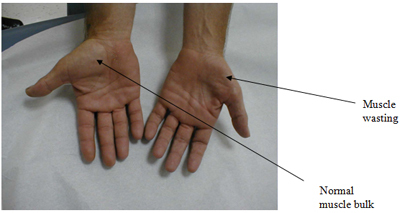 This is a nerve entrapment syndrome at the wrist. It is one of the most common problems seen by orthopaedic surgeons. 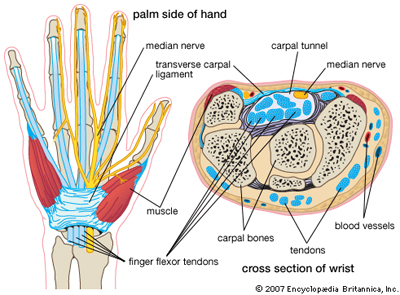 The carpal tunnel is a narrow passageway at the level of the wrist. Inside the tunnel run all 9 flexor tendons that bend the fingers and the thumb and also the so-called median nerve. The median nerve is like a big cable made of many thousands of small fibres. The nerve supplies sensation to parts of thumb, index, middle and ring finger as well as motor power to some of the small muscles in the hand. In carpal tunnel syndrome (CTS) there is increased pressure in the carpal tunnel, the nerve gets squashed and therefore malfunctions. Patients will notice pain and pins & needles in the hand and fingers. Patients typically complain of symptoms at nighttime. They wake up with pain, numbness and/or pins and needles in some or all fingers of the hand. They have to shake and massage their hand to get symptom relief. Sometimes the pain can radiate up the forearm towards the elbow. Some patients experience symptoms at daytime, for example when driving or reading a book. In more severe cases the numbness can be a permanent problem. These patients find it difficult to handle small objects or might even drop them. In longstanding severe cases some of the hand muscles at the base of the thumb might waste and become weak. These muscles will look flattened compared to the other side. Clumsiness and weakness of pinch and grip are the result. There is some debate as to whether CTS can be caused by repetitive activities or certain types of work. There may also be an association with the prolonged use of vibrating tools. In most patients taking a detailed history will point towards the diagnosis. Simple provocative tests on clinical examination will then confirm the diagnosis. In patients with unusual or atypical symptoms a referral for special nerve conduction studies is required. This is an investigation where the function of the nerves in the arm is tested and the area and severity of any nerve entrapment can be specified. Your GP will rule out treatable and reversible causes of carpal tunnel syndrome like hypothyroidism. Patients with inflammatory conditions like rheumatoid arthritis may respond to anti-inflammatory medication or different anti-rheumatoid medication. Most patients may benefit from a trial of non-operative treatment. CTS in pregnancy settles again in most women once the baby is delivered. Avoiding any activities that provoke the symptoms can be useful. A trial of splintage at nighttime is often the first line of treatment. This can be useful in patients with mild symptoms. Cortisone injections may be considered. These help to reduce swelling and may be considered in certain patients. When is surgery required and how does it work ? Surgery is useful for all patients who didn't respond to non-operative treatment. Patients with moderate to severe symptoms and those with underlying bony deformities from arthritis or fractures are rather unlikely to respond to non-operative treatment and are usually better advised to undergo surgery. Surgery has traditionally been carried out as a mini-open procedure with excellent results. I have now started to offer patients the option of endoscopic surgery. Both procedures are carried out under local anaesthetic (with the patient awake). The endoscopic procedure has a number of advantages: smaller incision, the incision is in an area that’s less prone to cause pressure pain, quicker recovery/return to work. The long-term outcomes are comparable. At the moment the endoscopic procedure is only available to privately insured and self-funding patients. I’m working on the business case for NHS patients. When can patients start using their hand again ? Patients can mobilise more or less straight away within limits of discomfort. The bulky outer bandages can be removed after 2 days following surgery. A small dressing is left in place to protect the wound while it heals. The dressing can be removed 2 weeks following the procedure. I use absorbable sutures. Most patients are able to use their hand for light activities within a few days. Return to work depends on the patient’s occupation and can range from a few days to 4 weeks. Endoscopic surgery offers an opportunity for a quicker recovery and quicker return to work compared to open surgery. What are the risks and complications involved in surgery ? Generally speaking this is a fairly simple and straightforward operation, that shouldn’t take more than 10-15 minutes. However, as with any operation there can be complications. Most of them are minor in nature and can be treated. Pain of local anaesthetic: Injection of the local anaesthetic (if used) will be painful. This is the worst part of the procedure and lasts for only a few seconds before the hand becomes numb. Scar: The operation will leave a thin scar in the palm close to the wrist. This may be painful. Massaging with moisturiser once the wound has healed is often helpful at softening it and decreasing the pain. Bleeding: There may be damage to a vessel causing prolonged bleeding. This is usually stopped at the time of operation. You may notice some spotting on your bandage. Bleeding following surgery can usually be stopped by simple measures like high elevation of the hand and a pressure dressing. Persistent pain, tingling or numbness: may continue in the hand despite the operation. This can either be because the nerve has been damaged irreversibly prior to surgery from longstanding compression or because it has not been sufficiently decompressed at the time of surgery. The procedure may need to be repeated. Persistent weakness of fingers despite operation: This depends largely on the severity of nerve compression prior to surgery and the potential of the nerve to recover. Infection: The wound may become red, swollen, hot and painful. There may also be a discharge of fluid or pus. Antibiotics are needed to treat the infection. Scar/ keloid-scar: This may grow thickened, red and painful (also known as keloid scar). This is more common in Afro-Caribbean people. Complex Regional Pain Syndrome (CRPS): this is pain that continues long after one would expect and is much greater than one would expect with a small scar. There are various techniques that are helpful in relieving CRPS. These include massage, splintage, physiotherapy or injection with medicines such as guanethidine. Painful wrist: this is usually temporary, but may be more prolonged. The wrist may also be weak initially, but this usually resolves. Damage to tendons: damage to tendons may cause loss of flexion of those fingers/parts of the hand. This may require repair. This is a very rare problem. 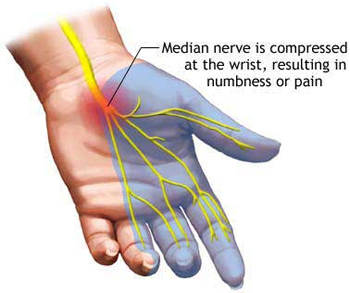 Nerve injury: extremely rarely the median nerve itself can be damaged causing numbness. The nerve will have to be repaired. Damage to a small sensory branch to the palm of the hand can occur, this can leave patients with a small area of numbness in the palm or a small painful lump called a neuroma. How successful is splinting ? Splinting is mainly beneficial in patients with mild symptoms and a short history (1). A short period of splintage (3 weeks) will show, whether a patient gets any benefit from this treatment (2). Some patients get excellent long-term improvement in their symptoms following a short period of splintage, but the long-term outcome might be better with surgery according to the literature (3,4). How successful are injections ? Injections can be effective in the treatment of CTS, at least in the short term (5). Patients with mild symptoms may even benefit in the longer-term (6). 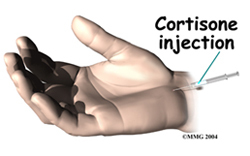 There is however some concern regarding the safety of injections because there is always a small risk that cortisone might be injected directly into the nerve (7) which will lead to irreversible damage to the nerve (8). I prefer not to inject carpal tunnels as a routine, but will occasionally consider injections for patients who can’t undergo surgery. How successful is surgery ? Surgery is very successful with a low complication rate of less than 5%. The success rate is approximately 95% (9). As a general rule of thumb symptoms that are of intermittent nature (pain at night, occasional tingling etc.) disappear within days of surgery. Many patients get their first night of uninterrupted sleep during the first or second night following surgery! Symptoms that have been present permanently will take longer to resolve. The degree and speed of recovery depends mainly on the degree to which the nerve has been damaged from long-standing entrapment. This also means that some symptoms in particularly bad cases may only recover partially, if the nerve has already been damaged beyond recovery. Muscle wasting and weakness often show no or only little signs of recovery, even after otherwise successful surgery. Nobuta S, Sato K, Nakagawa T, Hatori M, Itoi E. Ups J Med Sci. 2008;113(2):181-92: Effects of wrist splinting for Carpal Tunnel syndrome and motor nerve conduction measurements. Werner RA, Franzblau A, Gell N. Arch Phys Med Rehabil. 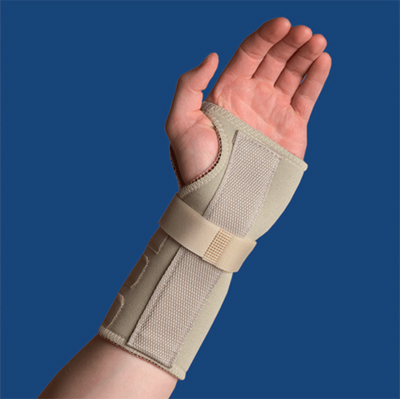 2007 Apr;88(4):544: Randomized controlled trial of nocturnal splinting for active workers with symptoms of carpal tunnel syndrome. Verdugo RJ, Salinas RS, Castillo J, Cea JG. Cochrane Database Syst Rev. 2002;(2): Surgical versus non-surgical treatment for carpal tunnel syndrome. Verdugo RJ, Salinas RA, Castillo JL, Cea JG. Cochrane Database Syst Rev. 2008 Oct 8;(4): Surgical versus non-surgical treatment for carpal tunnel syndrome. Milo R, Kalichman L, Volchek L, Reitblat T. J Back Musculoskelet Rehabil. 2009;22(2):59-64: Local corticosteroid treatment for carpal tunnel syndrome: a 6-month clinical and electrophysiological follow-up study. Agarwal V, Singh R, Sachdev A, Wiclaff, Shekhar S, Goel D. Rheumatology (Oxford). 2005 May;44(5):647-50. Epub 2005 Mar 1: A prospective study of the long-term efficacy of local methyl prednisolone acetate injection in the management of mild carpal tunnel syndrome. MacLennan A, Schimizzi A, Meier KM, Barron OA, Catalano L, Glickel S. J Hand Surg Am. 2009 May-Jun;34(5):875-9: Comparison of needle position proximity to the median nerve in 2 carpal tunnel injection methods: a cadaveric study. Swan MC, Oestreich K. J Hand Surg Eur Vol. 2009 Feb;34(1):135-6: Re: Median nerve damage following local corticosteroid injection for the symptomatic relief of carpal tunnel syndrome. Weber RA, DeSalvo DJ, Rude MJ. J Hand Surg Am. 2010 Feb;35(2):207-11. Epub 2010 Jan 8: Five-year follow-up of carpal tunnel release in patients over age 65.